It started with a glass of whiskey and a couple of trips to Sidecar in downtown San Luis Obispo. Scott Romaine was a bartender and Daniel Torres frequently came in to enjoy a drink and conversation. On one of these occasions Torres said he talked to Romaine about wood that he had milled. It was sitting in his backyard and Torres didn’t have any idea of what to do with it. Romaine said that he and his best friend Pepe Sanchez had recently graduated from Cal Poly with degrees in architecture and design and could help turn that wood into furniture. “We can do something super awesome with that wood, and that started catching steam until we started our business,” Torres said. PASSION: The Deadwood Revival trio makes unique furniture pieces by salvaging fallen or dead trees throughout San Luis Obispo County. With Torres’s background in forest fire fighting through the U.S. Forest Service, Romaine’s architecture skills, and Sanchez’s eye for design and welding, Deadwood Revival Design came to life. 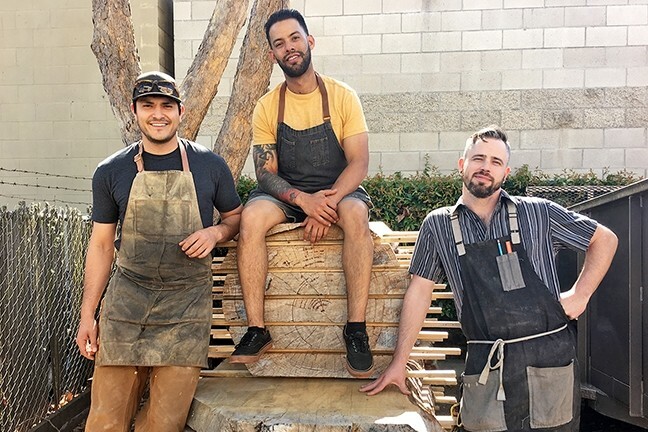 The trio is in the business of taking local fallen, dead, or diseased trees and creating unique pieces of furniture. They have a special process for finding these trees. At first, Torres checks Craigslist for listings of people who have fallen trees and are seeking a simple way to get rid of them. He said, as long as Deadwood can mill on site, the trio can push the fallen tree into the first phase of its new life. Romaine said they primarily find trees that they can work with through word of mouth. The mid-February storm that passed through the Central Coast downed many trees throughout the county. When the trio got a job off Corbett Canyon Road in Arroyo Grande, neighbors passing by would stop them and ask about their services. When scoping out the right tree for repurposing, Torres and Romaine agree that it depends on the diameter, complexity, and species of the tree. Romaine also sees it on a spiritual level—as in, the right tree picks them. “It’s like the tree that speaks to you, you just see it there and it’s hurting. It wants to be saved,” Romaine said. He said their business is not only about giving dying trees another purpose, but also about connecting with the product they’ve created. They believe there is a disconnect between people and the products they buy. That’s why Deadwood Revival Design takes the time to attach a story to each piece they create. They compile a description of which species the wood is, where it came from, how old it is, and the process required to make the final product from that slab of wood. “So, now, you have this rich documentation of your own piece, so it increases your pride in ownership and it gives you a backstory of how it came to be,” Torres said. The trio also partners with the National Forest Foundation in an effort to give back to national forests through the “Trees for US” program. They take pride in letting their customers know that with each purchase, a percentage goes toward the program. With every dollar that’s donated, one tree is planted. “We’re just in tune with what’s around here, but what about the rest of the nation? That’s what’s also important to preserving our forests,” Torres said. This goes back to their idea of giving every piece of the wood they mill a purpose. Dozens of leftover slabs from past projects sit on a rack in Deadwood’s office. Romaine calls it his “wall of fame.” Even these bits of wood might have another life yet. “I’ll find a purpose for it, maybe a cutting board or something,” he said. To learn more about the trio, their services, and past projects, visit deadwoodrevivaldesign.com. The 36th annual Morro Bay Harbor Festival that’s set for Oct. 7 is looking for additional board members. There are four positions open and new members are encouraged to have an enthusiasm for all things Morro Bay. To apply or to learn more about the position, call 772-1155 or email info.mbhf@gmail.com. Staff Writer Karen Garcia wrote this week’s Strokes and Plugs. Email tips to strokes@newtimesslo.com.